Watching Hill's testimony, I became antsier and angrier with each word. It was as if I was watching a horror movie as I was mentally telling Hill not to "open that door", to not go down that dark corridor, that there were monsters awaiting around the corner, and that she needed to fight with the fiercest and let it holler. I'm glad she didn't listen to me. What really strikes me about Hill's testimony is her poise. Her whole demeanor during that grueling grill is calm and patient. Even when the senators, notably Arlen Spector, showed contempt and attempted to derail her thought process and humiliate her further, her voice was fluid stream of composure. Anybody I know, including myself, would've been a bit more combative, playing right into that 'angry Black woman' trope. Hill, who at the time was a law professor at a small Oklahoma school, didn't give them the satisfaction of using her pride and racial stereotypes against her. 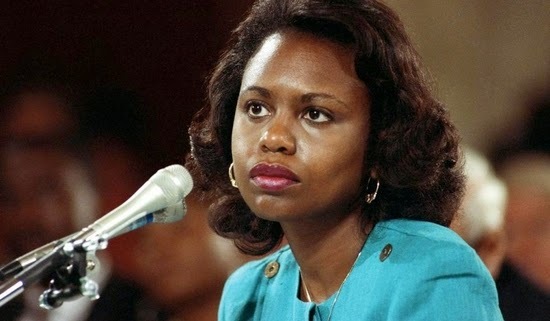 Hill had what she called later "rational anger", where she able to control her disgust in a room filled with hostility and still be able to clearly speak up for herself. I marvel at that since I can admit to being a drama queen whenever I get in confrontations. I also often feel that everything has to be a grand pronouncement when it comes to standing up for yourself. That in order to be heard you have to be loud and raise a ruckus. That the more emotion you show the more you are seen, maybe not understood but still taken into view. I guess I have grown too accustomed to this Internet savvy age where stunt queening and hashtag crusades are norm. Where you have to rack up hearts, likes and reblogs in order to feel that you've gotten your point across. Hill in '91 didn't have that type of technological soapbox to step on. All she did was tuck in her rage. Not everything has to be a demonstration, sometimes speaking calmly and directly is all the power you need. As one of Hill's colleagues described, the young law professor was going into the 'lion's den', and it's nothing short of the truth. Here was Hill, a Black woman, sitting before a panel of White men explaining to them in a rational manner about the sexual violence and humiliation brought onto her by a Black man who was in the process of being tapped to be inducted into our country's highest judicial power. Who was going to have an ounce of compassion or understanding when it came to that? It's almost crazy to watch, how Hill and her fellow work colleagues have to explain 'Sexism 101' to grown men and how perplexed and amused they look, making her repeat words like "pubic hair" and "Long Dong Silver" (the "nickname" that Thomas called his "member"*barf*), trying to wear her down while trying to make whatever claim she was making sound ridiculous when it was anything but. As much as I like to harmonize my feminism, believe that we're all in the fight together, there is always a racial divide with the movement because experiences between white and minority women are never the same. Most of Hill's white female supporters seemed to view this moment from an equality stand-point, how Hill represented fighting for equal respect and opportunity, a simpler leveled playing field, but there was more at stake than just standing up and being accounted for. As a Black woman I know far too well that our sexism is also our racism, twined together like ivy climbing in and out of a trellis --- there is really no way to detach the two. Our history of being mangled and weaned into gross stereotypes like "sexual Jezebels" or "undersexed Mammies" has us at a constant disadvantage of being misunderstood and disregarded no matter what we claim. Our right to possessing our own sexual agency is never appropriate, praised, and mostly its not even considered to be in existence. As much as white women experience sexism, minority women get it in rampant frequency, as our bodies have been historically treated as fetishes, chattel, as something not worth loving or aspiring to have. The media makes it worse, as white female celebrities are celebrated for having 'ethnic' attributes like big rumps and lips, while Black women are degraded for the exact same attributes. So when a woman of color is being sexually harassed, white supremacy and the stereotypes they have built about women of color will be first to say that she was asking for it, that she is delusional, simply because her race makes it so. I can't be polite about it. He truly is. Thomas (thankfully) doesn't wager much into this doc even though he is the main cause of the whole ordeal, but we do catch glimpses of his testimony and with just a few words he radiates arrogance, pettiness, and delusion. How do I know he's lying? Because his lips were moving, and moving to form such now infamous words like "high-tech lynching", words that attempted to derail the issue by bringing race into the room by his extension of the 'race card'. Typical misogynoir move. Twenty years onward, Thomas continues to say that Hill was his most 'traitorous adversary', but really he's describing himself, as his nomination into the Supreme Court Justice has done little to push positive narrative. He consistently continues to vote against laws that could benefit minority races including his own, and hasn't contributed much of anything to warrant him as a proper successor to the legacy that Thurgood Marshall so genuinely built. If there is a 'traitorous adversary' in building, it's most definitely Thomas. In 1994, a report entitled "The Other Woman" by Washington Post journalist, Florence George Graves, uncovered an agreement between Republicans and Democrats not to call Wright to testify with Hill because it would've caused an even bigger scandal, and would've promptly ruined Thomas' chances of confirmation to the court. All of this is appalling, because Hill became the 'fall guy' and another woman was muzzled strictly to keep Thomas' reputation afloat. The documentary sadly doesn't go into detail about Wright and her plight (this is Hill's story after all), but I figured to mention it because without viewing this doc, I never would've uncovered this bit of crucial information that would've given Hill's testimony the leverage it deserved. The nationally televised hearing wasn't a gallant hour for most involved, but still an important one in how it glaringly thrust the ugly and blatant sociopolitical sexism that runs rampant in our Western society to the front of the stage without glitter, gloss, smoke, and mirrors. It possessed all the key words and triggers we do not want to even utter or think about much less put in the same sentences (sexual harassment, Black women, government offices, pubic hair) and made everyone look them in the face with new light shined on them. Watching looks of discomfort crossing between the committee (which included Ted Kennedy and future vice president, our esteemed "Uncle" Joe Biden), the disparaging attacks against Hill from the accused Thomas, illuminated the issues we have between the sexes and how oppressing the patriarchy can be. It's fine when they are uttered behind close doors, but speaking out on them makes them real, makes them tangible things and for a lot of people, women included, it's tough to face them because we've been so conditioned to keep mum and be shamed over our sexuality and the abuse of it. I always say change and progress is supposed to make you uncomfortable, and from my standpoint, this was achieved. The testimony opened the door wide to what had been itching to get out, and Hill's testimony wasn't forgotten about in vain. Soon after Hill's testimony, calls came in from other government employees discussing the locked away sexual harassment in their workplace. An overhaul to the House and Senate occurred the following year as 53 women (6 Senators and 47 Representatives) were elected into office, the amount growing in decades to come. Towards the end of the doc, Hill gives viewers a tour of the basement in her home where she has collected several filing cabinets. The contents of those cabinets house all the hate letters and letters of support she has received throughout the years since the testimony. As the credits roll, Hill uncovers a hanger, and on that hanger is the brass-buttoned teal suit that she wore during the hearing. In my mind I thought, why would she save these things? Why does she want to be reminded of that brutal day? But I forget that in the process of wanting to erase, we are erasing the act itself, and that is worst than remembering. Silence is not always a sanctuary, it often doesn't move anything forward, just allows it to decompose into nothingness. When Thomas' wife, Ginni, made a bizarre phone call to Hill in 2010 asking Hill to 'tell the truth' and 'extend an olive branch' apology towards them, all Hill could simply do was chuckle about it, because yes, the message was ridiculous, but because at the end of the day she decided she was the winner, that she owned the situation when it seemed like everything was going against her. Hill is a survivor in the sense that she didn't allow this ordeal to consume her to where she couldn't live her life. Some say she's lucky that not much harm came towards her, she was able to keep teaching (she currently works at Brandeis University as a professor of social policy law and women's studies) and though she received death threats, she remained unharmed and has retained a sense of normalcy. As she rifled through the kept letters Hill expressed that she wanted to take some time to go through them all and make sense of how she lessened the choke-hold grip on women's voices in male-led spaces. She seems just as amazed as a lot of people are over how she overcame such a ordeal, but she's proof on how it is possible to turn piss into champagne. To me, Hill is a reluctant hero and activist. She was just someone who wanted to 'do the right thing' and who got caught up into something that became almost bigger than herself, but look at all that it sparked. How much progress was done after the fact, continues to get done. Though sometimes my cynicism does a lot of the talking, noting that things are still terrible for minority women, women in general, but Hill's courage to speak her truth is motivation for me that being idle I can't be, that silence is not an option especially when you want change to occur, that darkness can lead to light even if its just a pinprick in the distance.